Most people don't know that Dr. Rousseau was once considered one of the leading art critics in Latin America! We are lucky that subsequently, when returning to the US, she turned her formidable skills to the DC area - both in writing and in teaching! The Bethesda Arts & Entertainment District announced the top three Bethesda Painting Awards prize winners on Wednesday evening during the exhibition’s opening at Gallery B. Katherine Tzu-Lan Mann of Washington, D.C. was awarded “Best in Show” with $10,000; Carolyn Case of Cockeysville, MD was named second place and was given $2,000 and Kenneth Schiano of Chestertown, MD received third place and was awarded $1,000. Katherine Tzu-Lan Mann received her Bachelor of Arts from Brown University, RI, and Master of Fine Arts from the Maryland Institute College of Art. She has had solo exhibits at AIR Gallery in Brooklyn, NY, Rice Gallery at McDaniel College in Westminster, MD and Hamilton Gallery in Washington, D.C. She received artist in residence grants throughout the U.S. and in Austria and India. Mann was a finalist in the Bethesda Painting Awards in 2008, 2009, and received second place in 2010 and third place in 2012. She received Best in Show at Rawls Museum in Courtland, VA in 2011 and was a semifinalist for the 2015 Janet and Walter Sondheim Award. In 2016, Mann was an Individual Artist Grant recipient from the D.C. Commission on the Arts and Humanities. Katherine Tzu-Lan Mann, Washington, D.C.
A public opening will be held on Friday, June 9, 2017 from 6 –8pm. Gallery B is located at 7700 Wisconsin Avenue, Suite E in downtown Bethesda. The work of the eight finalists will be on display from June 7 - July 1, 2017. Gallery hours are Wednesday through Saturday from 12 – 6pm. Entries were juried by Don Kimes, Professor of Art and Director of Studio Art Program at American University; Trace Miller, Lecturer and Assistant to Department Chair at Towson University and Dr. Cole Welter, Graduate Program Director, Professor of Art, Painting & Drawing at James Madison University. The Bethesda Painting Awards was established by Carol Trawick in 2005. Ms. Trawick has served as a community activist for more than 25 years in downtown Bethesda. 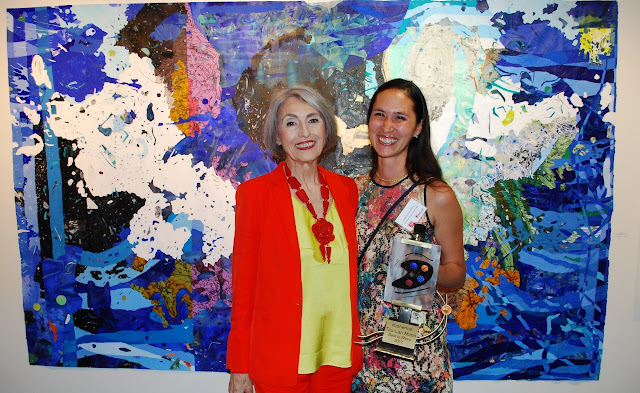 She is past chair of the Bethesda Arts & Entertainment District, past chair of the Bethesda Urban Partnership, Inc. and founder of The Trawick Prize: Bethesda Contemporary Art Awards. For more information, please visit www.bethesda.org. Mary Faith Flanagan (known as Faith), was an avid arts supporter who participated actively in the greater Washington, DC art world. She died suddenly at age 50 on Thursday, January 12, 2017 in her home in Washington, DC from unexpected cardiac events. Artist and curator friends are organizing this memorial exhibition to honor her vision and vital support to the art community. The exhibition will feature some of the artists that she worked with as an independent curator and arts promoter and some of the works from her personal art collection. After the opening reception on Saturday, June 24 from 6-8, gallery hours will be Thursday - Saturday, 12 - 6 pm through Saturday, July 8. They will host a closing reception as well on Saturday, July 8. Studio 1469 is a community multi-purpose studio/gallery in the Columbia Heights neighborhood of Washington, DC. Faith Flanagan helped program and run the space with Norm Veenstra.